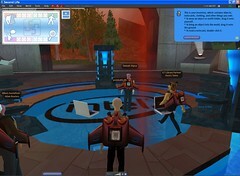 Exclusive tour of Intel’s new Second Life Island. I gots me a Jetpack! Intel, who’s a client for video and audio podcasts, took me on a tour of their newest addition to their Second Life island. This was a true brand experience, that infused the Intel message with a quest to find three parts; A jet pack, and two Intel chips to power it. Why jetpacks? They represent speed, agility, and flexibility. Those who complete the quest can use this jetpack to fly higher than most and fly quickly through Second Life , for geeks like me, it’s bragging rights for the second world and first. Tim who focuses on the gaming market at Intel toured myself, Adam who’s reporting from Reuters. (You know Reuters is taking Second Life seriously), and a few others. This “Journey to the heart of Intel Island” was unlike other simulations, it was multi-dimensional. There are elevators that let users move down several layers underground, as well as above a strategically placed tower. You’ll find cross branding events with Orange County Choppers, and a virtual music concert. At one concert hall you can watch videos of the multiply yourself campaign, but this time it features Second Life avatars, great cross-over. 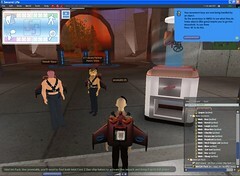 The experience is rich as flying laptops are pets, they provide additional on-brand messages and quest tips. 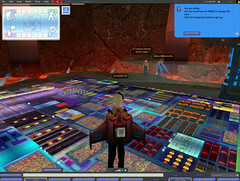 There are multiple venues to explore in the simulation, from an underground life size chip, to a conference area, to a concert area, this is a multi-purpose environment. What’s most interesting is that Second Life citizens will have to ask a jetpack owner where they got the jetpack, it’s a brilliant word-of-mouth campaign. But don’t ask me for tips, you gotta give it your own try, for some it will take some time to find the pieces, (maybe even 30 minutes) but it’s emotionally satisfying when you earn it. Thanks Intel, and MRM Worldwide/McCann Erickson (Updated July 25th: I forgot to include some of the folks who helped out on this) who was the agency who developed the Island along with developers Millions of Us. Ogilvy, the PR agency and Intel invited me for the sneak preview when the doors opened at 9am today. This was a unique interactive brand quest that left me feeling that by getting the chips would empower the virtual experience better, it make sense. I was asked for my feedback, and I said it would be interesting if the simulation would create a floating island high above that’s only accessible by the jet pack. Heck, take me to the moon or a new planet! If you’re a corporation in SecondLife, I’d love to hear about it, let me know, my email address is on the top right. I’ve seen a few corporate Second Life islands, this one is well thought out and is a good example of opt-in brand immersion, for corporations that want to enter this space, take note, this is a good case study.